Three lower Swansea Valley primary schools took part in the final of our 6th annual competition in Tabernacle Chapel, Morriston to win the J. Layton Watkins Trophy and £200. Adjudicator Huw Tregelles Williams OBE praised all the schools, their teachers and families for helping the choirs reach an excellent standard. Although there was hardly anything to choose between first and third places. Ysgol Gynradd Gymraeg Lon Las (conductor Enfys Rees) was eventually awarded the trophy. The other schools Ysgol Gynradd Gymraeg Tan-y-lan and St Joseph’s Catholic Primary school received a plaque and £50. While adjudicators D. Huw Rees, Eric Jones and Huw Tregelles Williams were deliberating, Morriston RFC Male Choir sang Tears in Heaven and All I ask of you, conducted by Deputy Musical Director Helen Wyn and accompanied by Hywel Evans. It had been a privilege to see the enthusiasm and enjoyment of the children, most of whom had never been in such an awe-inspiring building before. Our hope and intention is that experiences such as this will encourage them to perpetuate a love of music as they progress through the education system and beyond. We were again pleased to be invited to join the Hywel Girl’s Choir and Angelicus Celtis in a celebration of music in aid of the very worth while Charity “Swansea Foodbank”. This charity is close to the heart of the concert organiser Gorseinon Mayor Cllr Jan Curtis. To a very near sell out audience The Hywel Girl’s Choir started the evening with 4 numbers. “O Fortuna” from Carmina Burana, “Pie Jesu” from Requiem, “Stabat Mater” from Stabat Mater and “Y Delyn Aur”. 2nd Section “Panis Angelicus”, “Benedictus” and “Climb Ev’ry Moutain”. All conducted by their Director John Hywel Williams. With accompanist Jane Jewel, guest organist Huw Tregelles Williams, percussionists Gareth Hamlin. Morriston RFC Male Choir sang in three sections starting with an audience favorite “Gwahoddiad” followed by “Anfonaf Angel” (Soloist Huw Roberts). and “I Bwy Y Perthin Mawl”. 2nd Section “Sanctus”, “All I ask of you”, “Diolch i’r Ior”. Lastly “Tears in Heaven” and “O Gymru” (Soloist Huw Roberts). All conducted by MD D Huw Rees with accompanist Hywel Evans and guest organist Huw Tregelles Williams. Angelicus Celtis joined the celebrations and sang 7 songs in two sections. A selection from the “Ceremony of Carols”, “Ava Maria”, “When I fall in love”, “He was Beautiful”, “Angelicus Adoremus” and “Jerusalem”. All performances by The Hywel Girl’s Choir and Angelicus Celtis were extremely highly polished, giving their all and making a beautiful cohesive sound. It was a pleasure to listen to such wonderful voices. The evening concluded as usual with all performers and audience joining for the National Anthem. Thank you to St Catherine’s for the refreshments after the concert. Very much appreciated. A St David’s Day combined charity concert with Morriston Ladies Choir. Also starring guest artists Catrin Eluned Jones a Singer/Actress and Dafydd Mills Baritone/Bass. An excellent evening of music by all. Both Musical Directors Huw Rees and Anthoney Williams got into the spirit of the evening by wearing their Welsh Rugby shirts. Anthony has been associated with the Morriston Ladies Choir since 1974 becoming their Musical Director in 1976. Huw Rees has been associated with Morriston RFC Male Voice Choir since 1990 when he became the Choir’s accompanist. He was appointed its Musical Director in January 2004. 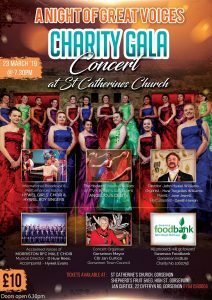 All proceeds of the concert to Marie Curie. We were invited to take part in the “Festival of Carols” Christmas concert at St John’s church in Gowerton this year. The concert was our last formal concert for 2018. There were 5 choirs along with other performers taking part in this celebration which showed off the talent and commitment of the people in the local area. Christmas is a wonderful time of year and the Christmas spirit worked it’s magic among the choirs and audience as the evening went on. The evening started with a welcome to the church by the Reverand Alex Pye followed by the congregational carol “O Come all Ye Faithfull” A list of the evening events is as follows. 1. A reading of “A Child’s Christmas in Wales” by Dylan Thomas was read by Barry Evans. 2. Soloist- “Millie Colebrook” accompanied by “Joan Lewis” gave us “Walking in a Winter Wonderland”. 3. St John’s Musical Players with 3 items “Mary had a baby”. a Christmas spiritual. Soloists- Alison Sandy and Betty Jones. Daeth Iesu o’i Gariad Soloist- “Sian Smith” 4. Spiritual “I’m Gonna Ride a Chariot in the Morning Lord” Soloists- “Sian Smith, Ann Benjamin and Huw Roberts” 5. “Halleluiah” Ian Lewis, Geraint Williams and Joan Lewis” 6. “Swansea Excelsior Ladies Choir” with 4 items. “Do You Hear What I Hear”, “Mary Did you Know”, “The Colours of Christmas” and “Twelve Songs of Christmas” 7. The Brass Ensemble played “Rudolph the Red Nose Reindeer” and “Jingle Bells” 8. “O Holy Night” Sang by Claire Allen Powell with Darryl Lewis on Cello. 9. “Cancer Challenge Singers” performed ” See the Morning Star”, “Somewhere in My Memories”, “The Most Wonderful birthday of all” with Accompanist Ian Lewis and Musical Director Geraint Williams. 10. “St John’s Sunday School” with “T’was the First Christmas Gift Ever Given” and “A Baby was Born in Bethlehem” 11. “Hands Together Singing Choir” who are a sign sing choir that use British Sign Language to sing songs. The choir signed 2 songs “Snow is Falling” and “See him Lying on a Bed of Straw” 12. Morriston RFC Male Choir concluded the performances for the evening with 3 carols “Son of Maria”, “Stille Nacht” (Silent Night in German) and Brenyn y Ser. Soloist- Huw Roberts. A wonderful evening of music was brought to a close with the communal carol “Hark the Herald Angel Sing” and a blessing from the Reverand Alex Pye. A big thank you to St John’s church for the hospitality in the Church Hall, very much appreciated. Merry Christmas and A Happy new Year to you all. The service was opened by the minister of Tabernacle Jill-Hailey Harris and then with a congregational carol “Once in Royal David’s City. “St Joseph’s Cathedral Primary School Choir” who made the evening a memorable event. We thank Tabernacle for the traditional Christmas mince pies and mulled wine in the vestry after the service. Very much appreciated. Again this year we were invited by The Friends Of Penllergare to help raise funds for the restoration and upkeep of Valley Woods and to get the Christmas season really under way. St. David’s church in Penllergaer was bursting at the seams, with all tickets sold in advance for what is becoming an annual event in the village. O Gymru, Anfonaf Angel and Brenin y Sêr. The concert also included Carey Beor and Julian Quirk who sang and played Guitar and Mandolin. Also joining them was our very own Stuart Loosemore who played Bass Guitar. Their first two songs were River and Monkey-Town and second session appropriate for the season I believe in Father Christmas and Stop the Cavalry. It was a wonderful lead-in to Christmas week, and we thank The Friends of Pellergare for the refreshments in the Llewelyn Hall after the concert. Why not take a stroll through the woods to blow away cobwebs during the holiday period? Their coffee shop will sustain you! We were pleased to accept the invitation to sing at Holy Trinity to help raise funds for the church. We have not sung in this part of the world for some time so it was a pleasure to be back. We sang to a near full church for an appreciative audience. The maestro D. Huw Rees again gave a sterling performance as did our accompanist Hywel Evans. We sang a good selection of songs from our repertoire with two of the songs “Tell my Father” and “O Gymru” led by our soloist Huw Roberts. We finished with a medley of songs from The First World War. The concert also included four members of Loud Applause Rising Stars (LARS) . Established in 2013, LARS is an exciting group of talented young singers who are eager and ambitious to fulfill their potential and withe help and guidance take their talent to a broader audience. Accompanist for LARS was Catrin Hughes who teaches at Ysgol Gyfun Y Strade. Catrin is a trustee of LARS Charity and a Musical Advisor to the charity. It was a great pleasure to listen to these young people. A big Thank You also goes to the church for the refreshments put on after the concert. Very much appreciated. The Brangwyn Hall was packed for this special Remembrance Day Concert and Service marking the centenary of the end of The First World War, with contributions from the City of Swansea Concert Band, City of Swansea Pipe Band, 215 Squadron RAFAC Corps of Drums, Swansea Music Youth Choir “Choirworks” and Dancerama Performing Arts Group. David John Ward “Ollie” (Veteran) who read the poem“The Day of the Poppy” left the audience in deep thought. Dancerama sang beautifully, with outstanding soloists among their number. It is wonderful to see all these young people coming to stage and performing. Swansea Pipe Band raised the tempo and demonstrated their skills of piping and drumming. The Corps of Drums gave a wonderful display of their skills. It’s no wonder they are highly regarded. Our first contribution was “Tell My Farther” Soloist Huw Roberts and a Medly of WW1 songs. We were joined by Gwawr Edwards for “Morte Criste” and“The Holy City” . The traditional service of remembrance was conducted by Rev. Lionel Hopkins MBE DL, and presentations were made by Her Majesty’s Lord Lieutenant of West Glamorgan Byron Lewis KSTJ. The evening was again compered seamlessly by Brian Sullivan. We thank organiser Phil Flower MBE, British Legion Community Fund Raiser for South Wales, for the opportunity to take part in the city’s tribute to the fallen of all conflicts. We were invited by The Salvation Army to sing at the Remembrance Service in Morriston Park on Sunday morning. This was well attended considering the weather. A wreath was laid by our Chairman on behalf of the choir. An evening of music in a combined concert with Morriston Ladies Choir and featuring Rhydian Jenkins to remember the Morriston men who were lost during the Great War. Rhydian won the Aled Lloyd Davies Award in the Unawd Cerdd Dant Blue Ribbon Competition at this year’s National Eisteddfod. Proceeds from this concert will go to “Help for Heroes” charity. This was our second concert for Ebenezer in Neath to help raise funds for Melin Infants School, and supporting local children. We were joined by Gail Pearson – Soprano. Gail is a renowned Welsh Soprano who has divided her time between Operatic, Concert and teaching work and brings a wide range of repertoire, from baroque to contemporary. Also the children of the local Melin Primary School gave an accomplished performance. We opened the concert and were followed by Melin Primary School and Gail Pearson all drawing appreciative applause from the capacity audience. Our own performance was conducted by D. Huw Rees and accompanied by Hywel Evans. Huw Roberts our very own soloist sang Anfonaf Angel and O Gymru accompanied by the choir which brought a standing ovation from the wonderful audience. It was good to see that many of the young children and their families had stayed to listen to the performances, and we hope that nights like this will inspire them to keep singing as they progress through the education system and beyond.